A few months ago I stopped by this slightly beat up and charming antique shop in Traveler's Rest, South Carolina, but it was closed. There was no sign to announce when it would be open but I liked what I saw when I peeked through the window. This past Sunday, I drove by again with my mom and saw that the front door was open so we went on in....It's called Shades of the Past. I love old glass bottles as they're great for displaying a lone flower or two or they work well for holding cold iced tea on the back porch. 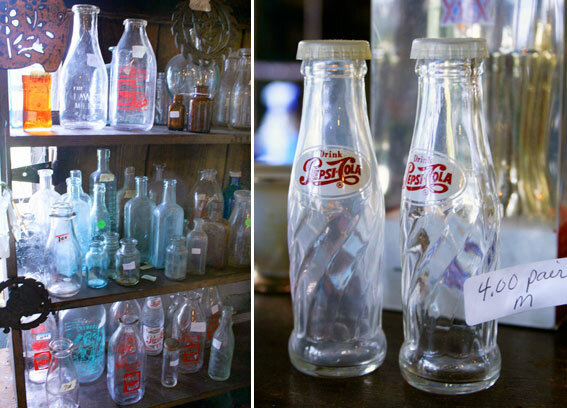 Jimmy has a whole section of the shop dedicated to glass bottles... all old, all with their own personality. Angie says her dad gets his goods from anywhere and everywhere. He takes trips to yard sales and flea markets throughout the South. His motto, according to her, is 'tacky sells.' Even stuff that seems no one would want in their home, seems to always find a home. 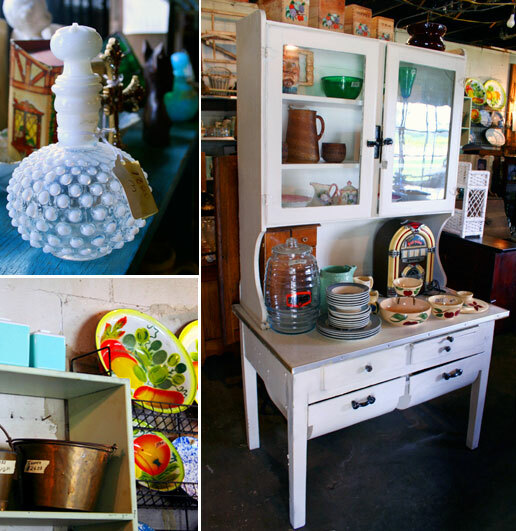 There's a few treasures for everyone in here- and good prices abound. Jimmy likes things with a weathered look and even has a whole section dedicated to farm tools (but unfortunately it was a darker area I couldn't photograph as I sadly left my tripod at home.) But every nook and cranny of this shop is filled and it's a lot of fun to snoop around to see what you can find. Shades of the Past is about 20 minutes north of Greenville off of Highway 25. It's amidst other antique shops and produce stands that line this suburban highway. Take a gander if you get a chance, and say hi to Jimmy. I hope next time I visit, he's there.